Many website owners or designers choose to protect their ownership of the text, pictures, other content, and design of their website by including a copyright on each page. So, how important is this? 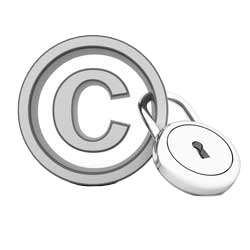 Some site owners may think that their material is protected with or without a copyright notice on it. Others may feel that since material is on the web it is “open source” and anyone can use it. Or they may feel that it is not a criminal offence to take something that is on the web. The “de minimis principle” of law states that copyright isn’t concerned with the very little things. While this may be true, since the content and design is yours and represents your ideas and hard work - any deterrent to prevent others from "lifting" (aka stealing) your work is certainly beneficial. How Should I Do It? The use of a copyright symbol and/or the word “Copyright” has the effect of reminding visitors to your website about your rights under copyright laws. By including this copyright on every page of your website can act as a deterrent for those who might be thinking about lifting your material without permission. Including the short statement “All Rights Reserved” next to the copyright symbol and year sends a very clear message that you are aware of your rights to copyright your materials. This text can also be linked to a more complete copyright statement on another page in your site. By including the name of the copyright owner, you let your site visitors know who holds the copyright. This will make it clear what entity to contact to get permission for their use of any materials on the site. Copyright date, symbol, and statements are usually placed in the footer. What Date Should I Use in my Copyright? We like to include not only the current year in the copyright statement, but also show the year the website was first launched up to the present year (for example, © 1997-2016). The start date shows the longevity of the site, building your reputation. Updating the current year each January also helps to establish and maintain a small element of a current feel for your site. This date change tells your site visitors that you are actively updating the site on a consistent basis, giving the impression that all the materials are in fact up-to-date, which has value in and of itself. Can I Use your Pictures / Text ? Site owners of rich content websites are often contacted by people who want to use their materials. Most website owners/developers know that “Content is King” therefore they are trying to grow the content on their site, too. It’s important to think these issues through in your company / organization and decide on a clear-cut policy. There are definite signs that duplicate content on the Internet (someone else using your text) can hurt your search engine ranking. So allowing people to use your articles and stories will hurt you in the long run if they aren’t attributed correctly. It would be a wiser policy to allow people to link to your materials on your website, perhaps with a short teaser, but not to use the articles in their entirety on their website. On one big content-rich website that we own, we only allow other sites to link to us. We give community organizations permission to use the articles that they have written in hard copy publications (newsletters, magazines), but not on the Internet. We also require that they credit the source and include the site URL, which provides promotion for our website as well. Put a photo credit watermark on a picture, or just under/alongside to a picture to emphasize that the picture is copyrighted. You can also include a line near the bottom of the page that the picture is on stating photo credit and copyright restrictions. If the site has multiple photos that need to be credited, you can create a separate page to display all those photo credits. You can put a copyright notice on your content without registering it. However, if you register your material with the U.S. Copyright Office for $25, they can assist if there ever is a legal dispute about copyright infringement of the materials. Getting a copyright today could provide protection and exclusive rights, lasting the life of the author plus seventy years. Some site owners may want to distribute their content freely to the world. You can properly license your content to reflect this desire. Creative Commons, a non-profit organization, helps people and organizations to share their works to the world with wording consistent to that of copyright law. For more information on the Creative Commons, visit the Creative Commons website. If you expect traffic from outside the US - and who are you kidding if you aren't? This is the digital age, after all, be aware that US copyright law may not be enforceable overseas, or may involve very costly litigation. In summary, protect your content and creative work by using a Copyright on every page of your website. If you'd like to learn more about how to protect your content, please Contact Us! © 1997–2019 Yakindo Web Designs, Inc. Yakima, Washington Website Developers. All rights reserved. Providing Website Development and Website Design Services to Companies, Government Entities and Non-Profits for 21+ years!